For the 17th time in 11 years, Congress delayed the threatened cut in physician Medicare reimbursement known as the sustainable growth rate (SGR) provision. Organized medicine can relax for a bit as the oft-kicked SGR can gets booted down the road toward next April. By the 12th or 13th time that a threat doesn’t materialize, it’s easy to perceive it as something of an empty threat. Of course anyone directly involved in these beltway reimbursement dances can’t really acknowledge that publicly. Did you really think Congress wouldn’t pass some short-term SGR patch? I never thought the 24% cut would happen. While physicians and their representative organizations certainly want a permanent “doc fix” to resolve the issue, the sky hasn’t fallen once since 2007 when this problem was legislated. You may have noticed that the ACR treaded lightly on the failed permanent fix and basically lauded the legislation. Why? 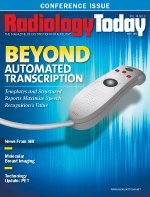 Because even though this year’s SGR fix is temporary, the ACR believes radiology won something bigger: an opportunity to have its appropriateness criteria, or perhaps something close to them, built into the ordering process for advanced imaging exams in Medicare and Medicaid. The provision certainly isn’t a panacea for the challenges radiology has endured in the past six years; imaging has seen radiology reimbursement decline despite all those SGR patches. We’ll certainly have to wait and see how it plays out because a law’s impact is never clear until after its regulations are written. But here and now, it’s pretty hard to look at the appropriateness criteria component of this law and see it as anything other than a positive outcome for radiology. PS: Also hidden in the so-called SGR fix was a one-sentence provision that delays ICD-10 implementation until at least October 1, 2015. That makes me wonder to what extent that threat will actually materialize, especially after months of vehement statements that ICD-10 would not be delayed again—until it was.